Sweet soy sauce. Kecap manis. To Indonesians, that is the perfect combination of the sweet and the umami. We like our food a little sweeter. Back in college, it was the only condiment I kept in my kitchen at all times. While living with my aunt in South Carolina, I easily picked up their sweet soy sauce habit. We put it on scrambled eggs. We put it in grits. 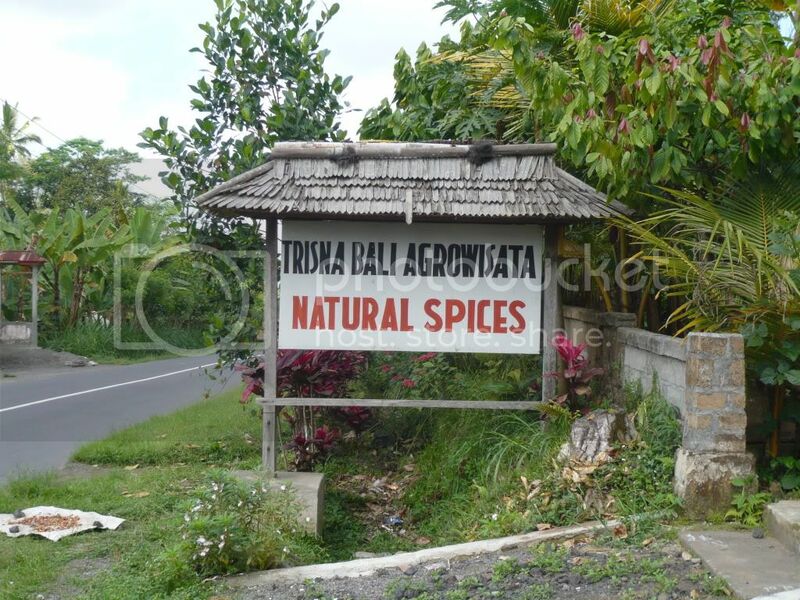 But one American expat and his Javanese chef-wife in Bali had an even better idea. Let's put it on barbecued ribs, baby. They opened Naughty Nuri's Warung in Ubud, serving the carnivorous natives and tourists ribs, steaks, lamb chops and more, marinated in "Indonesian-style marinade." That is, it's sweet soy sauce based. Yes, Bali has the suckling pig "babi guling", ikan lilit, bebek bengil, what have you. 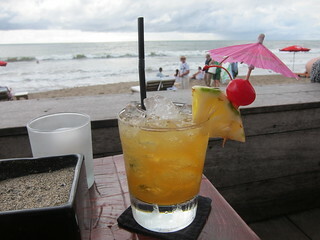 But my brother and all my cousins (ok, well, all my male cousins) claim Naughty Nuri's is their favorite eatery in Bali. A warung is meant to be a low end eatery and while the ambiance at Nuri's is undoubtedly casual, the prices are pretty high for the country's GDP. Bali is, after all, a tourist hotspot. $7 is a steal for New Zealand lamb chop, but a pricey meal for your regular native. If you're reading this, though, you're probably a tourist, so go there and splurge on fall-off-the-bone tender ribs and juicy lamb chops. But please, don't ask for ketchup or A1 sauce. You won't be needing it. The good thing about renting a car along with a driver when you're a tourist is that your driver knows places you don't. As soon as we landed, we asked the driver to take us to Ubud so we can have some suckling pig, but our driver took us for a short pit stop at Trisna Bali Agrowisata (agro-tourism) on the way. Trisna Bali is a small garden/farm growing a variety of fruits native to Indonesia, including mangoes, mangosteen, rambutans, and more. This was my opportunity to introduce my guests to salak, a tropical fruit they (and probably you) had never seen before. Salak is a curious fruit. The inside contains three lobes of firm and crisp meat, similar in texture to an apple although firmer and not as juicy. 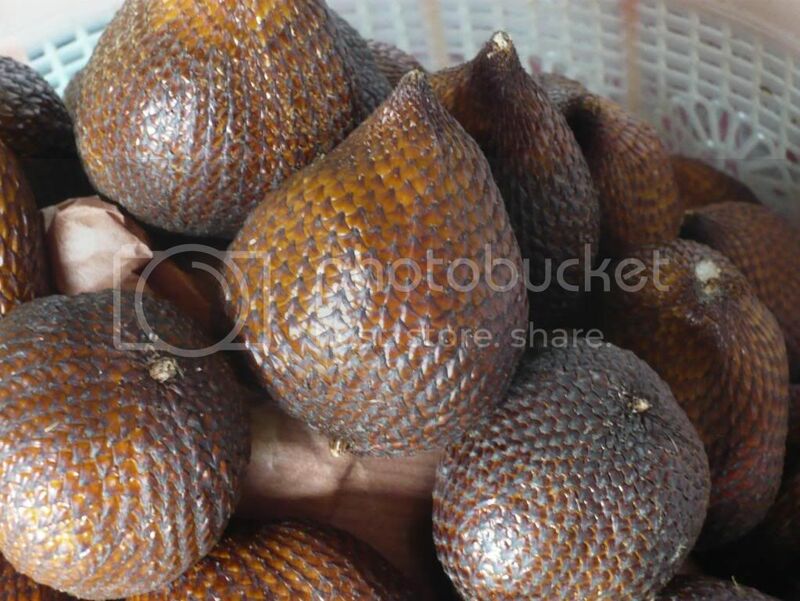 A good salak is sweet and a little tart, but the moistness depends on the variety you're eating. Per popular request, here is a photo of the inside taken from Salak's Wikipedia page. 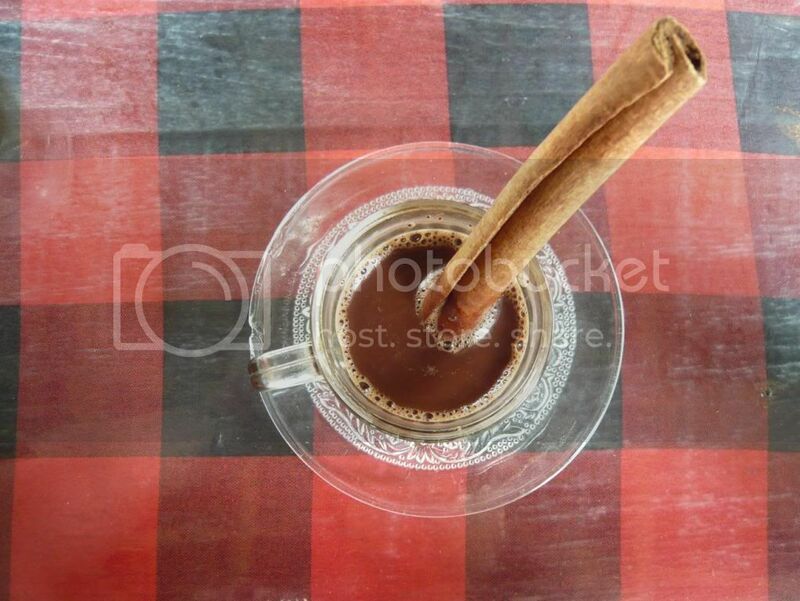 When we visited, they gave us a small cup of the Balinese hot chocolate for free, complete with cinnamon sticks! 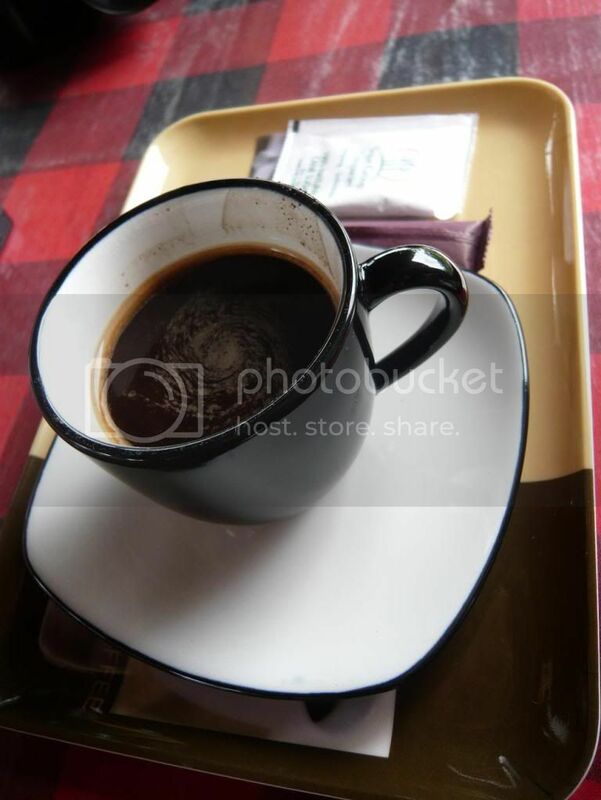 But of course, since we were in Indonesia after all, we had to get some Kopi Luwak. Kopi Luwak, peaberry coffee, or whatever other name it goes under, is the most expensive coffee on the planet and is made with ... civet poop. Luwak is a civet native to Indonesia that eats coffee berries and apparently knows enough to only eat the best quality berries. So when they poop out the beans, those coffee beans are some high quality coffee beans! Also, the civet's digestive systems supposedly helped break down the coffee beans in such a way that makes the coffee that much better and more intense to drink. Yup, by hand, over the fire, for hours and hours. Makes one appreciate it more. 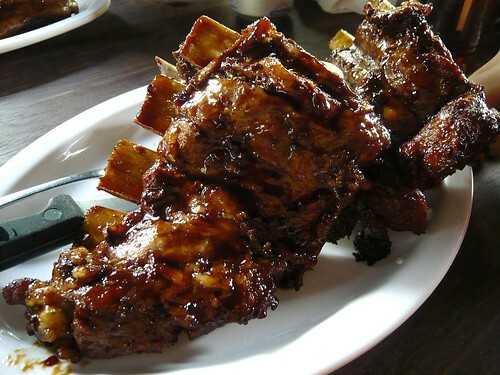 One last meal in Bali took us back to Ubud, home of Babi Guling Ibu Oka and Nuris bbq ribs. 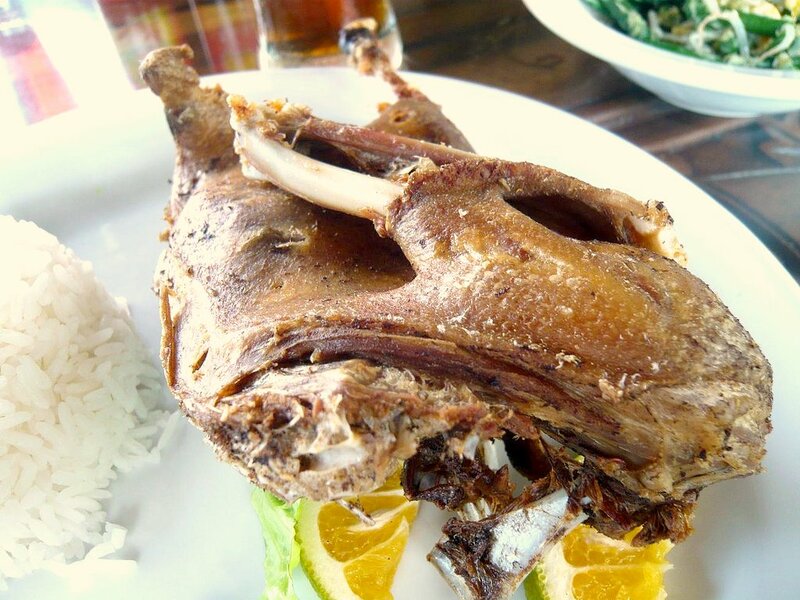 This time we visit the famous Bebek Bengil restaurant, a.k.a Dirty Duck Diner. We were greeted by a decidedly Balinese entrance and valet parking, already suggesting that this place probably has quite the ambiance and won't be cheap (relatively speaking). 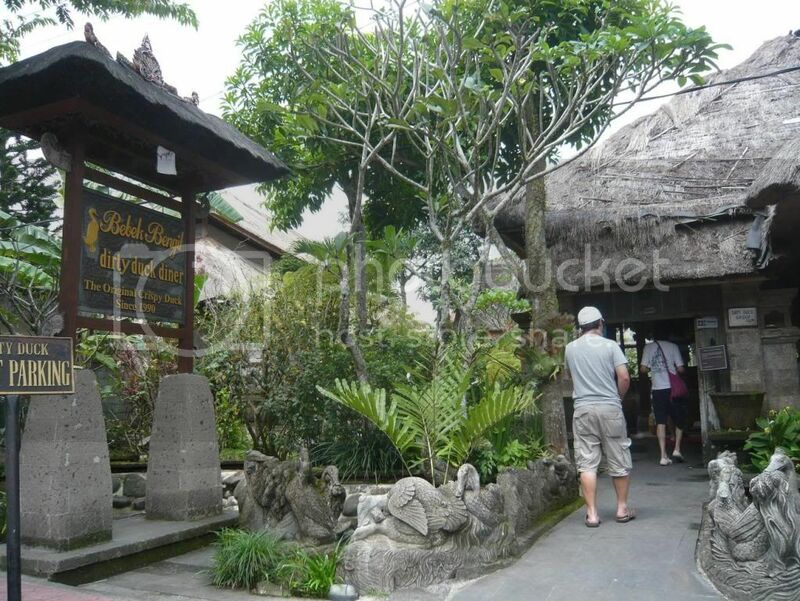 Indeed, Bebek Bengil offers the option to dine on the balai-balai, the wooden sitting platforms available around the restaurant. You can, and probably should, reserve these platforms beforehand. We didn't, but after waiting a few minutes managed to score the best seats in the house, a small balai right next to the rice paddies. We all got the famous crispy duck, Bebek Bengil, which was rather heftily priced by Indonesian standards at Rp.67,000 (about $6.70) a plate. 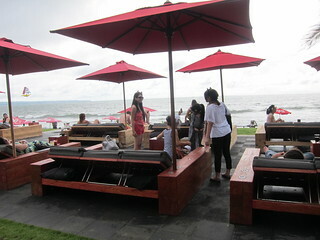 Then again it is Bali and one always pays for great ambiance. Shoes off, sitting on the platform lesehan style with pillows, just shooting the breeze while staring at the verdant rice paddies, this ambiance is certainly hard to beat. Our plate of crispy fried duck and rice finally came, to be eaten with our fingers. The duck was fried to a crisp in palm oil, after being seasoned with bay leaves, lime, ginger, galangal, coriander, and other herbs and spices. Under that deliciously crispy skin was lean, but tender and full of flavor duck meat. 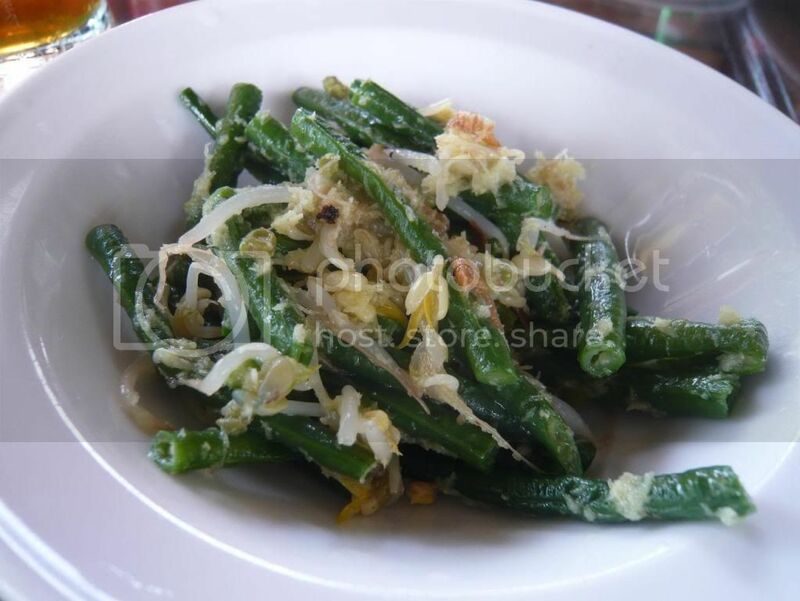 This was served with some urap made with green beans and bean sprouts cooked in coconut milk, galangal, and chili. The urap had a nice flavor that accompanied the duck perfectly. We were also served some amazing house-made chili sauce made with chili, shrimp paste, onions, and other good stuff. Even I could not avoid dipping everything in that sauce. Needless to say, I cleaned all possible skin and meat off the bones. The portions here aren't big and the price is rather high, but chilling in the breeze after licking the duck bones clean was heavenly. Oh yes, we could definitely eat like this everyday - if only Bali was just a drive away. 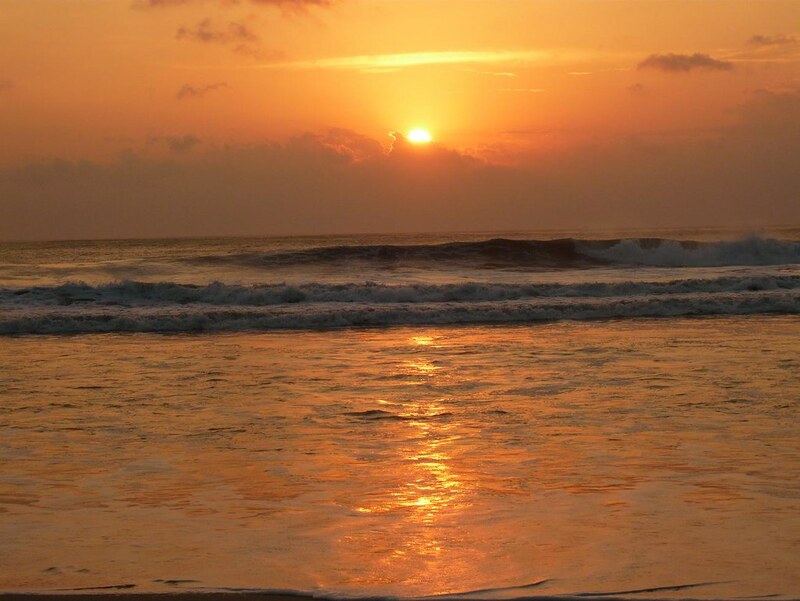 I had forgotten how beautiful Bali is. When it was so close to 'home' (Surabaya - 30 minutes by plane), you kinda take it for granted. But this trip reminded me full force. There's of course the beach. Kuta beach was cleaner than I remembered, still as crowded as ever though, but we had ample space to sit and take in the breathtaking view of the sunset. There are the beautiful tiered rice paddies everywhere, and seeing the workers everywhere in this developing country remind you of where your food came from. And why it's so cheap. But, of course, we're here for the food. 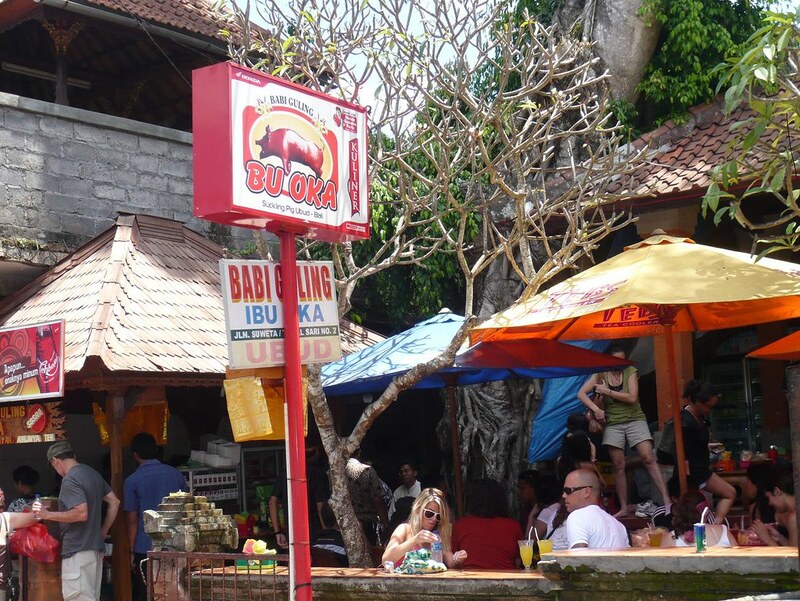 Not to be outdone by Anthony Bourdain, our first meal in Bali was perhaps Bali's most famous dish - at its most famous restaurant, suckling pig aka Babi Guling Ibu Oka. Tourists and locals alike flock to this place. Most of the seats are lesehan, which means you sit on the floor (on a pillow), barefooted. Even then we had to wait 20 minutes or so to get seated. As soon as we walked up we were greeted by a suckling pig on a tray, where they are cutting the meat and skin off. Eye candy. We were already hungry, but the drool-worthy view made the craving even harder. 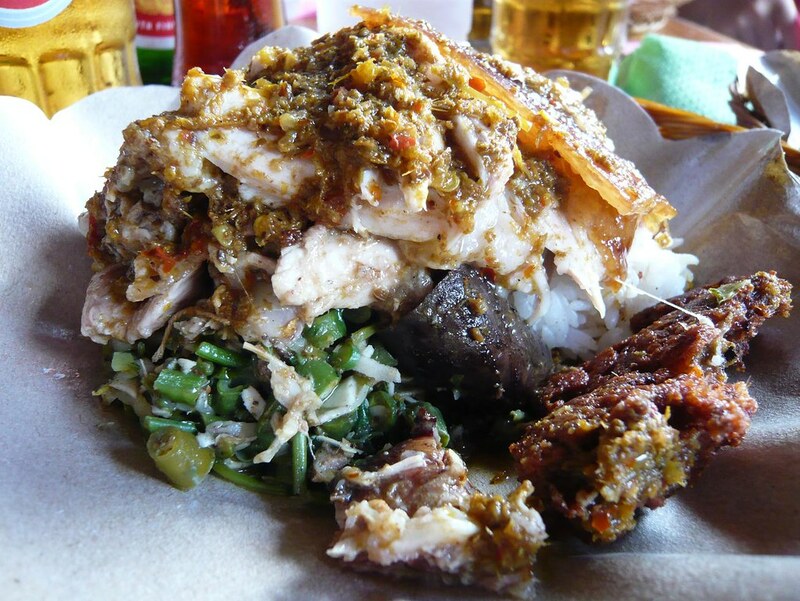 The "babi guling special" comes with rice, suckling pig's meat, crispy skin, deep fried skin, blood sausage, and urap made with green beans. This Rp.25,000 (~$2.50) plate is satisfaction incarnate. 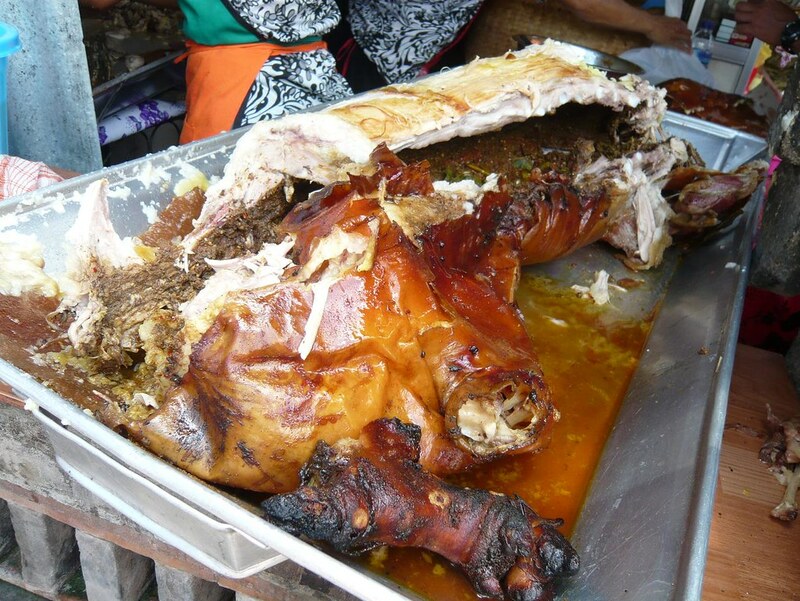 What makes Balinese suckling pig so special is that it had been stuffed with herbs and spices and cassava prior to roasting over an open flame, making it so full of flavor. The meat is still rightfully tender, and the meat is only the start of it. There's the oily crispy skin, and the delightfully crunchy fried skin, not to forget the chunky and flavorful blood sausage and the spicy vegetables. 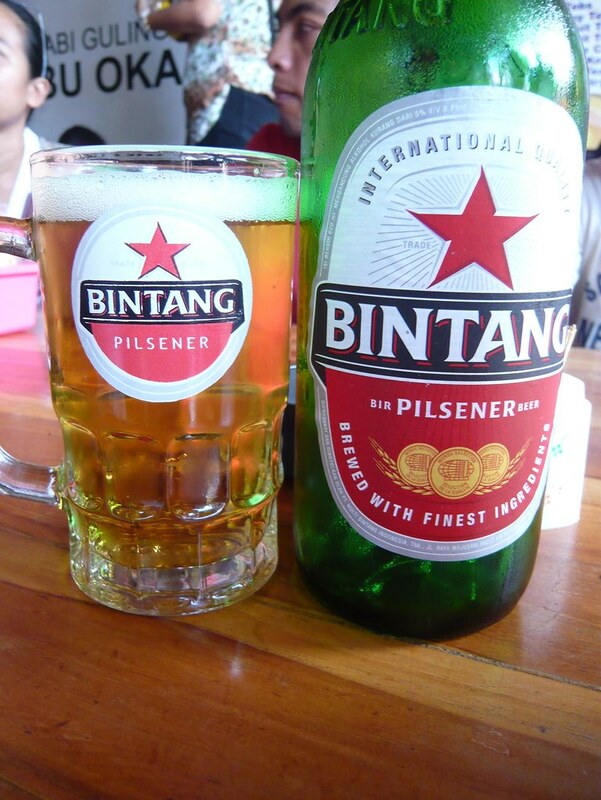 All this goes down perfectly with a bottle of Indonesian Pilsner, Bir Bintang (For those interested, Bintang is pretty light with a slight hoppy finish). The only thing that might be a problem for some people is that Ibu Oka's suckling pig has now become less spicy (though you can get more chili on the side), perhaps to 'tone down' to tourist level of spice. Better for me I guess, since I could eat it without breaking too much sweat. 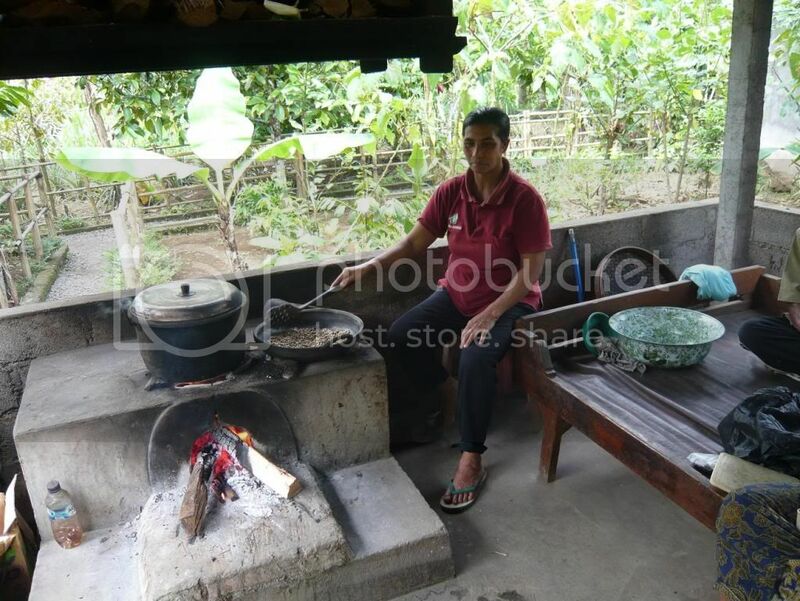 Either way, Babi Guling Ibu Oka is still one of the best (if not the best Balinese meal).